Going through my mom's belongings, cleaning out her dresser drawers; with her bras I find a small toy pterodactyl I imagine the story she made up for herself on why it would be natural to have that with her bras. Mom always had a wild imagination. She kept many secrets. It was her way. I have learned some new, fun, sadly-sweet things about Mom by going through the things she left behind. I learned that she, too, worried about her weight in her 20's and 'planned' to lose X number of pounds by such and such a date. She asked her husband to support by not bringing home junk. She reached her goal and then the pounds crept back on. Talk about the circle of life. . . .
Eleven years ago, without anyone knowing, Mom enrolled in a creative writing course. Now I can read the stories she never shared, the secrets she kept. Speaking of secrets: Mom liked to keep the lingerie and clothing, stored within her many dresser drawers, smelling fresh. You know what she used? She used the nearly empty containers of her solid stick roll-on deodorant - Secret. There were over 20 used containers scattered throughout all her bureau and dresser drawers. Talk about keeping secrets. . . . .
What would be found in your drawers? Would there be candy wrappers? Cookie tins? What would your secrets reveal about you? What would they reveal about me? When I go home I am going to start looking in my drawers to see what secrets I have waiting to be revealed to my children (and burn my old diaries). Today I woke up famished. First time in a long time. So, I wrote out all my food before I started breakfast, but it was hard. I wanted to eat and keep eating, so I took a power walk for 45 minutes to get some air into my lungs and re-focus my brain. It worked. The walk took me past my parish from 25 years ago as a funeral was just starting. I went in and prayed for a few minutes, leaving after the gospel reading. I always loved that particular church. The Pastor who was there 25 years ago always made it a point to pray for people suffering from addictions to drugs, alcohol and food. Today is a work day via computer. I will be working from my daughter's. Thursday, I will take a trip down to Manhattan to have some time alone in the apartment. Since both my parents died there AND since my Mom was a HUGE FAN of the TV show GHOST HUNTERS, I know she would love it if I went there with my camera and took photos of the empty rooms. We each must grieve in our own way. Mine includes doing things my mom would like, even though she is not here to share in those things any longer. That is funny about the deodorant. I use used dryer sheets or empty perfume bottles. My kids are always in my closet (legitimately) looking for things for me. And I think middle knows where more stuff is in the rest of the house than I do. I was reading your post wondering if I have one secret in the whole house. I don't think I do. I have a stash of kids stuff, but my husband knows all that. And I have weeded thru my own stuff regularly. Now I have always said that if something happens to my husband I am coming home from the funeral and not going to bed until his closet and office are empty. Might involve a dumpster. . .
You do sound much more like yourself. Protect yourself from the AFTERS when you get home, you have been thru a lot. What a treasure to find her creative writing pieces, Jane! Thank you for sharing about your mom. Bitter sweet some of that. 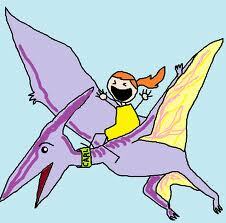 I love the pterodactyl! I have some weird things hidden around. My husband will find it amusing and totally predicable. I also wrote him some notes over time and have stashed them around. When he tosses my things, there they will be. I am a morbidisimo. I use bounce sheets to keep things fresh smelling. That and powder. Deodorant takes up a lot of room!